In 1660 the English civil war came to an end. With the monarchy restored, in the person of the continentally cultured Charles II, the twenty-year ban on English theaters was lifted. 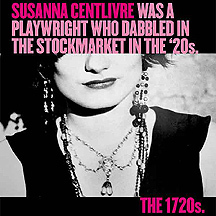 So were the prohibitions that had historically barred women from producing, acting or writing for the English stage. This period, a fresh start for the newly re-opened theaters, became a heyday for women playwrights. Even so, the works and the women who created them have not come down to us. This imbalance in theater history has not only deprived the contemporary stage of great material, it has also likely contributed to the minority status of women working in theater today. I. 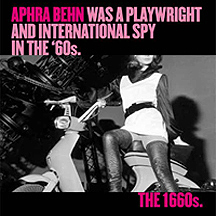 The Symposium (“THE FIRST 100 YEARS: THE PROFESSIONAL FEMALE PLAYWRIGHT”) was part of New York State October Humanities Month, and took place on Saturday October 26, 2002, 3 p.m. at the American Airlines Theater (Times Square, Penthouse Lobby). Free and open to the public, this event featured scholars from all over who have done groundbreaking work on these women and their plays, interspersed with a some scenes presented by actors to illustrate and further the conversation. II. The Reading & Discussion Series will look more closely at the work of 5 English Women Playwrights of the 17th & 18th Century: Aphra Behn (1640-89), Susanna Centlivre (1669-1723), Hannah Cowley(1743-1809), Elizabeth Inchbald (1753-1821) and Joanna Baillie (1762-1851).) Four of these five playwrights were guaranteed productions every time they wrote a new play. But, the group as a whole was selected because they represent a variety of distinct voices and styles that show the development of the female playwright over a century. They are just a handful of the dozens of female playwrights writing professionally during the period. The readings are scheduled over a nine-month period and will be held at sponsoring theaters around New York City in an open and informal atmosphere where discussion, inspiration, and future collaborations can be sparked. The goal of the project as a whole is to expose audiences and theater artists – from designers and playwrights, to dramaturgs, directors and actors — to the playwrights and their works, and to make some of the exciting scholarship being done in this field more accessible and useful to the theater artist community. In the Symposium, readings, and discussions, key questions will be raised that will help in future study of these women, future productions of their plays, and new works inspired by each. Considered by David Garrick to be the best comedy of the age, The Discovery with its star-studded cast was an immediate success at Drury Lane in 1763, and at various revivals years later. Taking on the topic of what marriage can be, might be, ought to be, and too often is The Discovery was both an influence on Richard Brinsley Sheridan’s plays, and sometimes their rival at competing theaters. (between Avenues A & B — accessible from the F train at 2nd Avenue). Directed by Gwynn MacDonald, The Juggernaut Theatre Co. SYMPOSIUM on Women Playwrights of the English Stage (17th & 18th century) – Their Work And Highly Dramatic Lives. THE FIRST 100 YEARS Symposium was taped by TOFT (Theatre on Film and Tape Archive)/The New York Public Library for the Performing Arts and can be viewed by theatre professionals, college-level students and researchers with work or study-related reasons for viewing; contact (212) 870-1642 for further info and to schedule an appointment. The New York Public Library for the Performing Arts is located at 40 Lincoln Center Plaza (between Columbus and Amsterdam Avenues at 65th Street.) Hours are Tuesday, Wednesday, Friday & Saturday from 12-6pm; Thursday from 12-8pm. IRVING FARM COFFEE CO. & DAN’Z COOKIES. Free and open to the public, this event featured scholars doing groundbreaking work on these women and their plays, interspersed with scenes presented by actors to illustrate and further the discussion. 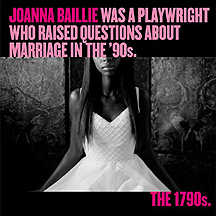 The 2002-03 Reading & Discussion Series will look more closely at the work of 5 English Women Playwrights of the 17th & 18th Century: Aphra Behn(1640-89), Susanna Centlivre (1669-1723), Hannah Cowley (1743-1809), Elizabeth Inchbald (1753-1821) and Joanna Baillie (1762-1851).) Four of these five playwrights were guaranteed productions every time they wrote a new play. The group as a whole was selected because they represent a variety of distinct voices and styles that show the development of the female playwright over the century. Katherine Phillips, Aphra Behn, Frances Boothby, Elizabeth Polwhele, Ariadne, Delariviere Manley, Mary Pix, Catherine Trotter, Jane Wiseman, Susanna Centlivre, Mary Davys, Eliza Haywood, Penelope Aubin, Elizabeth Cooper, Charlotte Clark, Mrs. Hopper, Letitia Pilkington, Catherine Clive, Philippina Burton, Dorothea Celisia, Jael Henrietta Pye, Lady Dorothea Dubois, Hannah More, Charlotte Lennox, Hannah Cowley, Elizabeth Griffith, Sarah Cheney Gardner, Elizabeth Craven, Ursula Booth, Mary Darby Robinson, Elizabeth Richardson, Sophia Lee, Mrs. Burgess, Frances Brooke, Margaret Cornelys, Betsy Sheridan, Anna Maria Edwards, Harriet Homcastle Hook, Elizabeth Inchbald, Elizabeth Kemble, Christian Carstaires, Harriet Lee, Lady Eglantine Wallace, Frances Brooke, Marianna Starke, Anna Ross, Ann Yearsley, Fanny Burney, Dorothy Jordan, Catharine Metcalfe, Amelia Alderson Opie, Hannah Brand, Eliza Parsons, Catherine Cuthbertson, Mrs. Rainsford, Mary Darby Robinson, Sarah Cheney Gardner, Elizabeth Edmead, Joanna Baillie, Maria Therese DeCamp Kemble, and Dorothea Plowden . An Ordered Society: Gender and Class in Early Modern England. Oxford & New York: Basil Blackwell, 1988. Female Playwrights and Eighteenth-Century Comedy: Negotiating Marriage on the London Stage. Spectacular Politics: Theatrical Power and Mass Culture in Early Modern England. Baltimore: Johns Hopkins Univ Press, 1993. Women, Nationalism, and the Romantic Stage: Theatre and Politics in Britain 1780-1800. Cambridge: Cambridge Univ Press, 2001. Brant Clare & Diane Purkiss eds. Women, Texts and Histories, 1575-1760. Plot and Counterplots: Sexual Politics and the Body Politic in English Literature, 1660-1730. Women in British Romantic Theatre: Drama, Performance, and Society, 1790-1840. New York: Cambridge Univ Press, 2000. Tricksters & Estates: On the Ideology of Restoration Comedy. Lexington: University Press of Kentucky, 1997. Women Playwrights In England ca. 1363-1750. 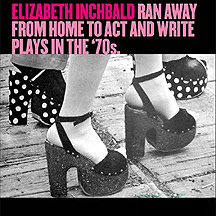 Lewisburg: Bucknell Univ Press, 1980. Masquerade and Gender: Disguise and Female Identity in Eighteenth Century Fictions By Women. University Park: Penn State, 1993. Getting Into the Act: Women Playwrights in London, 1776-1829. London, New York: Routledge, 1995. Look Who’s Laughing: Gender and Comedy. Langhorne, PA: Gordon and Breach, 1994. Grundy, Isobel & Susan Wiseman eds. The First English Actresses: Women and Drama, 1660-1700. Women in England, 1500-1760: A Social History. The Body Embarrassed: Drama and the Disciplines of Shame in Early Modern England. The Prostituted Muse: Images of Women and Women Dramatists, 1642-1737. Women in English Society, 1500-1800. London & New York: Methuen, 1985. Broken Boundaries: Women & Feminism in Restoration Drama. Lexington: University of Kentucky Press, 1996. Playwrights and Plagiarists in Early Modern England: Gender , Authorship, Literary Property. Ithaca: Cornell Univ. Press, 1996. New York: St. Martin’s Press, 1998. Schofield, Mary Anne and Cecilia Macheski eds. Curtain Calls: British and American Women and the Theater, 1660-1820. Sexual Suspects: Eighteenth Century Players and Sexual Ideology. The Rehearsal. Restoration Drama: An Anthology. Oxford: Blackwell Publishers, Ltd., 2000. Broadview Anthology of British Women Playwrights, 1776-1843. Love and Thunder: Plays by Women in the Age of Queen Anne. Lyons, Paddy & Fidelis Morgan, eds. Female Playwrights of the Restoration: Five Comedies. The Meridian Anthology of Restoration and Eighteenth Century Plays by Women. New York: Penguin Books, 1994. Volansky, Michelle & Michael Bigelow Dixon eds. Kiss and Tell: Restoration Comedy of Manners: Monologues Scenes and Historical Context. New York: Smith & Kraus, 1993.